Welcome to The Marnie and John Burke Memorial Library at Spring Hill College. Opened in the summer of 2004, this 71,000 square foot state-of-the-art library is named in recognition of the parents of John Burke, class of '63, and his brother Kevin Burke, class of '66, whose generous contributions have made the library possible. The Library houses nearly 500,000 books, journals, videos, microforms and other materials that support the educational mission of the college. In addition to physical holdings, the library also offers access to almost 90,000 electronic titles including databases, journals and ebooks. 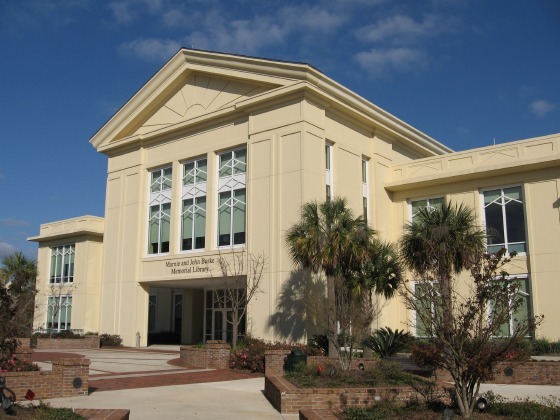 Also housed in the Library are Archives and Special Collections, Administrative Information Services and the Agnes Williams Faculty Development Center. The mission of the Burke Memorial Library is to support the Jesuit philosophy of learning and the liberal arts tradition that educates library users through information literacy, research, and technology. With the intent of preparing students to engage actively in the global community, the library provides access to a diverse collection of information resources and services. A place of learning, academics, and collaborative space, the library serves as a user-centered environment. The Burke Memorial Library principally acquires and provides access to materials that support the curriculum and reflect the college’s Jesuit identity and liberal arts tradition. The library strives for excellence in advancing the College's teaching, research and service programs by anticipating information needs, providing access to resources, and promoting effective use of information by students, faculty, and staff. In addition, the library’s Archives & Special Collections selects and preserves material of local, regional, and Jesuit significance. The library also serves the public as a selective U.S. Government depository for the 1st Congressional District of Alabama.